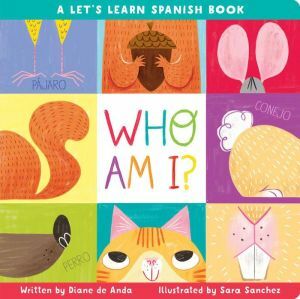 Who Am I?, a Let’s Learn Spanish lift-the-flap book introduces little ones to the Spanish words for animals around the house. I purr and play with yarn and string. “Me-ow, me-ow” is what I sing. Introducing a creative way to learn first words in Spanish, Who Am I? uses the power of rhyme and lift-the-flaps to teach basic animal names. Perfect for young readers and families looking for a gentle introduction into a new language, Who Am I? focuses on everyday animals in the first book in the Let’s Learn Spanish series.